7 Nights from £499 inc Flights, Hotel & VIP Transfers - £150 OFF! 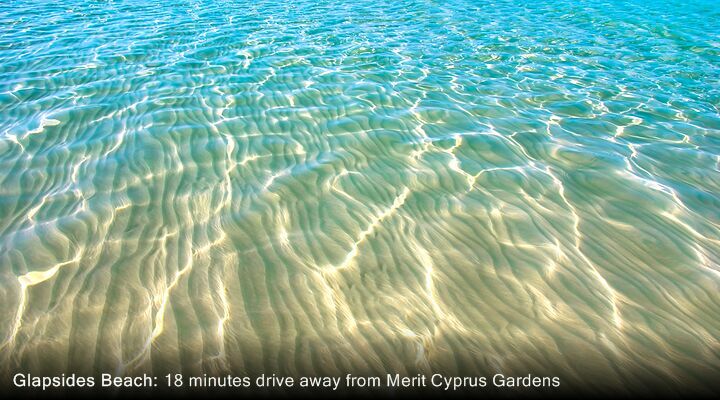 The Merit Cyprus Gardens Hotel is perfect for those who love sand, sea and open skies on their North Cyprus holiday. 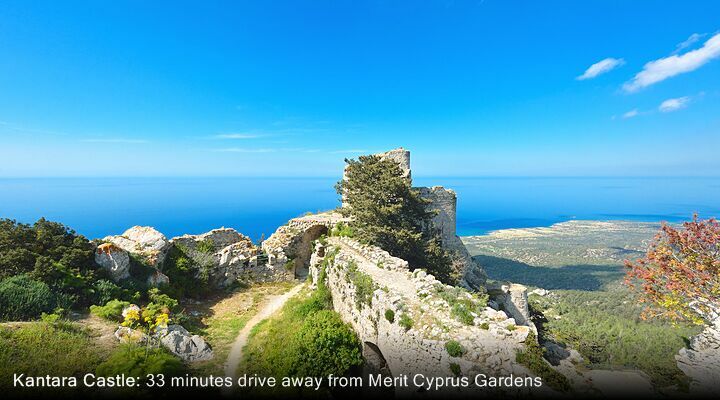 With a private beach, richly planted gardens, and a choice of villas or hotel rooms, the Merit Cyprus Gardens offers summer holiday relaxation for all the family. Sitting on its own sandy beach on Famagusta Bay, the Merit Cyprus Gardens Holiday Village (its official name) is just made for relaxing summer holidays. Laze by the pool, stroll by the sea, take a nap in a hammock in the shady gardens, or try your luck in the casino - there’s always something new to enjoy. Choose from a well-appointed hotel room with all mod cons, or live life the Mediterranean way in a pretty whitewashed villa - with a kitchen, king sized bed, rain shower, and jacuzzi! Whichever accommodation you choose, all teh facilities of this luxury hotel are ready for you to enjoy. Few North Cyprus hotels can boast of their own 1.5km beach with private pier, AND a sun-drenched swimming pool set in lush gardens! Spend your day lulled by the lapping of waves on the beach, where the view stretches all the way to Turkey. Or, relax with a book by the sparkling clean swimming pool while the kids splash around in safety. Cooling drink are never far away, with both a Pool Bar and Beach Bar available during the summer months. 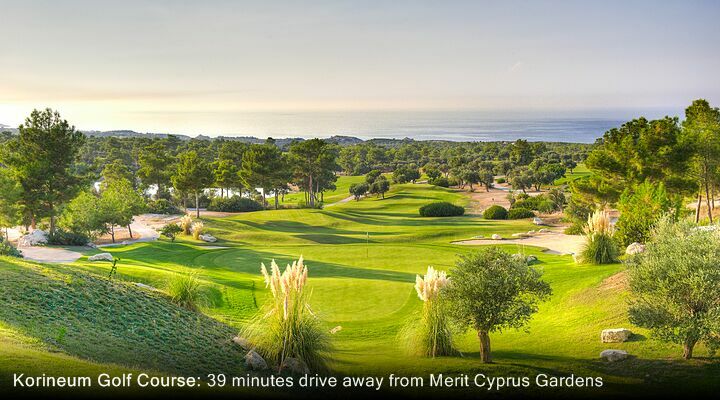 At the Merit Cyprus Gardens Hotel Famagusta, you can learn to scuba dive, take a tennis lesson, ride a horse through the surf, or try your luck in the glittering casino. Hire a car and explore the ancient sites, take the local bus into the walled city of Famagusta, or enjoy a jeep safari to the rugged Karpaz Peninsula, home to the famously grumpy wild donkeys! Love buffet food and love to eat outside? The Garden Restaurant offers a tempting selection of Cypriot and international dishes, with the choice between cool, inside dining or al fresco tables under the bougainvillea-covered pergolas. 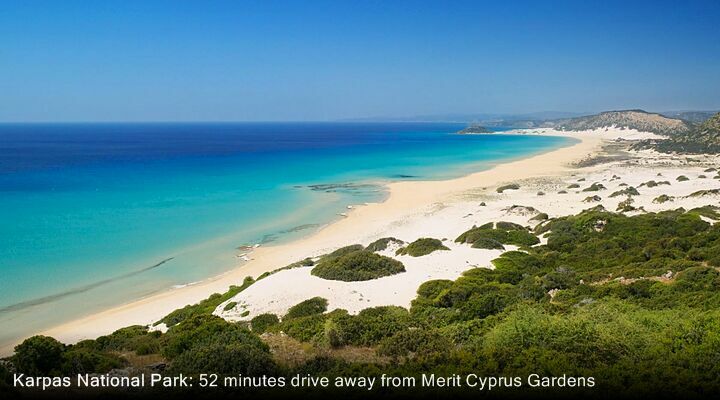 Children will love the Merit Cyprus Gardens Hotel, with its playground set amongst the trees, and easy access to the lovely sandy beach. Horse-mad kids will especially adore the Merit Cyprus Gardens Horse Club, where they can enjoy riding lessons and pony treks along the beach. They’ll also love exploring the ancient ruins of Salamis just down the road – no kids can resist the remains of open air Roman toilets! 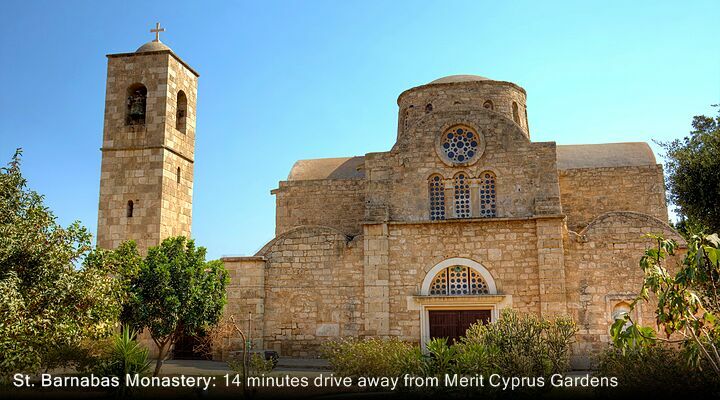 The east coast of North Cyprus is stunning; sweeping sea views, sandy beaches, ancient ruins, traditional fishing villages, and the walled city of Famagusta to explore. It’s also less developed and quieter than the sometimes overcrowded north coast. So, you can always find a space on the beach, a shady spot under a tree, and a table for a tasty freshly-caught fish dinner at a local restaurant - for a fraction of Kyrenia prices! 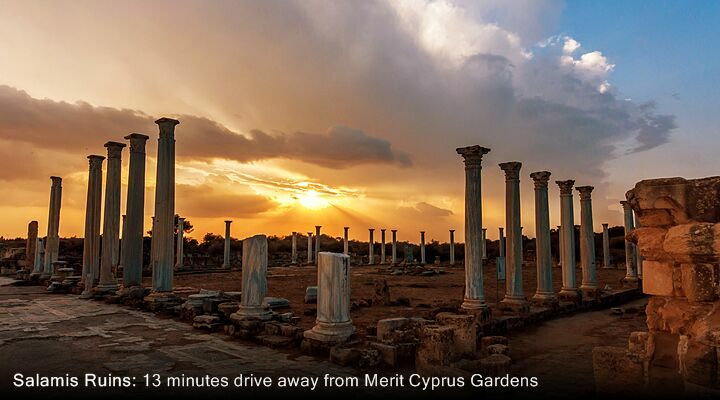 Transfers from Ercan International Airport to the Merit Cyprus Gardens Holiday Village are a joy, an easy drive on empty roads where traffic jams simply don’t happen. While others Kyrenia-bound guests are still on the road, you can be relaxing by the pool or enjoying a drink from the Moonlight bar. How lovely is that!